In an age of obscene and extensive reality TV shows, does The Truman Show stay true to the obtrusive? Truman is the centre of a worldwide TV show where he’s unknowingly the lead character, but when strange things start to happen around him he begins to realise his life might not be what it seems. On the film’s release in 1998, Jim Carrey was on top of his game having just come out of Liar Liar and the Ace Ventura duo; and as far as performances go he certainly hasn’t lost it. As the lead character he plays Truman, a naive nice-guy who enjoys being a passive part of society. This passive side to him almost becomes annoying and could annoy some who dislike seeing Carrey restricted away from brash humour and silly acting; however his character gets more interesting and similar to other Jim Carrey characters when he starts asking questions. Truman’s determination to find something larger in life is admirable and enjoyable to watch and sometimes even touching – like when he attempts to overcome his fear of the sea which was manufactured by the loss of his father when he was younger by the studio. To bolster the lead’s role in the film, Carrey is surrounded by a wonderful supporting cast. Without even coming into direct contact, Ed Harris plays the most villainous character of the fake world as the director of the show, Christof. Despite coming across as cold and unemotionally attached due to his persistence in keeping someone in a city for other people’s entertainment, Christof does open up at times and clearly feels some affection to Truman, whom he’s watched since he was a baby. The whole idea of the control centre and Chrisof’s base being located on the fake moon adds a central sense of villainy and a god complex to boot, but the character mostly acts as a gateway into understanding the more sinister and corporate side of the TV show without alienating the viewer; this is impressively done successfully with just the one man. The world created around Truman is impressive, thorough, and even believable in an odd way. The many characters and overall design of the town develop a Stepford Wives-style, creepy suburbia where everyone wears bright clothes and falls into routinely staged conversations. Without ever actually becoming scary, the set-up does create a sense of unease, which is aided by Truman’s unhinged behaviour later in the film. Truman’s peculiar and false world is accentuated by flicking back and forth between the people watching his TV life at home, in bars and at work while allowing the unfamiliar town to become believable in its bizarre setting. The Truman Show is a well constructed and accurate illustration of a reality TV show taken to the extreme. 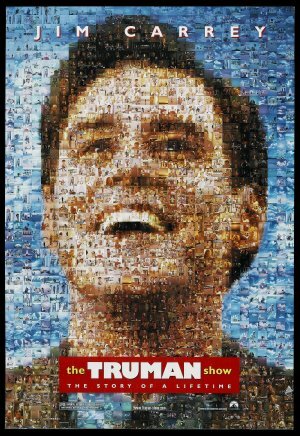 Jim Carrey is brilliant as Truman and creates an exceptional and driven character that fuels this great story, while helped by some great characters in his life. What did you think of The Truman Show? Is this one of Jim Carrey's best films to date? Let us know below.